The CA1 Exam Results Were Out! SA1 Is Coming Really Soon! 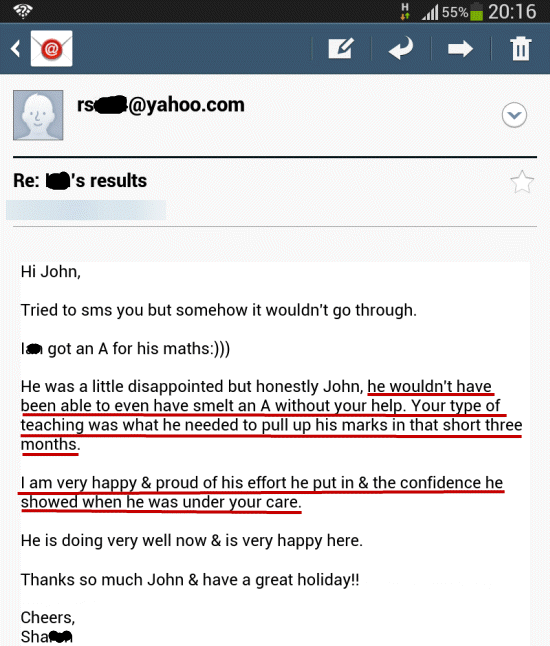 Singapore’s No.1 Math Coach Reveals “Exam-Tested” Secret (Currently Used By Hundreds Of His Students) To Scoring An “A” Or “B” Grade For PSLE Math This Year… Works Especially Well For Under-Performing Math Students Struggling With Problem Sums! Since you’re reading this, chances are you’re a concerned parent who has been sending your child for lots of Math tuition. So then… why did your child get below-average grades for the CA1 Math paper, despite all that money spent? Let John Yeo, an “international Math Celebrity” featured in numerous local and international media, share the truth with you (your current tutor will NOT want you to know this)! The CPS (Concepts-Processes-Skills) Mathadology – A simple, effective and proven-to-work technique specially designed to make even the hardest problems sums… as easy as 123! When your child applies this, high marks will be scored consistently for Paper 2 (the problem sums section). The exact Math resources, tools and study strategies your child needs to get an advantage over other students who are better at Math. If your child scored below 75, this “Math Enhancement Package” is what’s required to jump 2-3 grades for PSLE this year! 3 reasons why your child is unable to understand important Math concepts, despite going for lots of tuition and working hard. I’ll also let you know how to “turn on the switch” in your child’s mind, so that even complicated topics like Fractions and Ratio will be child’s play! Why doing top school papers and lots of assessment books are actually harming your child’s grades. This is the wrong way to prepare for exams (even though many others recommend it), which makes scoring high marks almost impossible. Discover the correct strategy for the best chance of an “A” or “B” for PSLE Math! Many other important PSLE Math insights required to score high marks, from Singapore’s leading Math Tutor and “International Math Celebrity”. Remember your child’s CA1 Math exam grade which you received recently? And since you’re reading this, I assume your child did not do as well as you wanted, right? Probably scored a C grade or below. And with PSLE less than 5 months from now for the P6s and SA1 in less than 1-2 months for P3-5s… time’s running out. The clock’s ticking. It may be the beginning of the year. But now is no time for taking it easy or long breaks or “wait and see moments”. The good news is, I have the solution your child needs! Through our proven “mathadologies”, we’ve helped thousands of students in Singapore and many other countries, improve their Math grades massively. For now, let me tell you some possible “Grade Killing” reasons why your child did not do well for the recent CA1 Math. Math is a subject that requires understanding of fundamental concepts and principles. Only after that, can questions from all topics be answered the right way for high marks. However, many students are taking the “short cut” way to prepare for exams: Overloading On Top School Papers & Assessment Books. But only if you use it in an effective manner. Top school papers and assessment books are meant for practice of already-understood concepts. They’re not really meant for helping your child to internalise key math principles. My point is: If your child is just doing and doing and doing without properly understanding fundamental concepts and principles, Math results will only get worse, and all that effort will be wasted! So what’s the right way to prepare for PSLE Math? When you sign up for your PSLE Math Booster Phone Consultation, I’ll share that with you, plus lots of other valuable strategies for acing PSLE Math. Most students lose lots of marks at Paper 2: The dreaded Problem Sums section. This is likely one of the reasons why you sent your child for tuition in the first place – To conquer problems sums. Do that, and your child would probably jump at least 2-3 grades for PSLE Math. Easier said than done though. That’s because many students, your child included, are being taught the wrong approach to tackling problem sums. What you may find surprising is that the key to solving problem sums is actually English. Why English? Because problem sum questions are often phrased using a high level of English that can be difficult to comprehend. So if your child can’t understand the questions, how can they be answered? Instead of focusing too much on the techniques to solve questions, I put great emphasis in helping my students understand the questions as well. In most classroom settings, students tend to be quiet, reserved and disengaged from the lesson. One of many teachers’ “nightmare scenario” is when a question is asked, and no one volunteers to answer. The students just stare back blankly. Or look away. Or aren’t paying attention at all. Especially when it comes to Math, such environments are toxic for learning. If your child is caught in such a situation, be it in school or tuition, scoring well for PSLE Math will probably be extremely unrealistic. That’s why the lesson plans designed by Learning Out Of The Box are meant to engage, educate and even entertain! That’s because our goal is to enable students to fall in love with Math. To see it as a fun and interesting subject. To show genuine desire to do well, because they love what they do. When that happens, an “A” or “B” for PSLE Math will be well within your child’s ability! Time To Right Your Wrongs And Prepare To Ace PSLE Math! How to spot PSLE exam questions the right way. Many parents and other teachers attempt to do this without much success. I’ve formulated a scientific approach with an uncannily high “spot rate” (around 83.4%), which allows your child to prepare well for “sure come out” questions. The exact Math resources, tools and study strategies your child needs to get an advantage over other students who scored better for the most recent CA1 Math exam. If your child scored below 75, this “Math Enhancement Package” is what’s required to jump 2-3 grades for PSLE this year! Register Now Before Limited Slots Are Gone Forever! Due to our regular and revision classes, we’ll be limiting PSLE Math Booster Phone Consultations to 50 parents. Slots will be given on a first-come-first-serve basis. So if your child really needs assistance for PSLE Math this year, hurry and register before your slot gets “stolen” by another parent! Looking forward to speak to you soon, and provide you with all the “ammunition” to fire your child from average to PSLE Math success! P.S. Just a reminder that your PSLE Math Booster Phone Consultation is limited to 50 parents. Please do hurry and register before they’re all taken. P.P.P.S. Here’re more success stories of how we turned our students from underachievers to scoring high marks for PSLE Math. Your child could be the next student to benefit from our proven and effective mathodologies!